I hope the saga of the twisted stitches and purl bump socks is over. 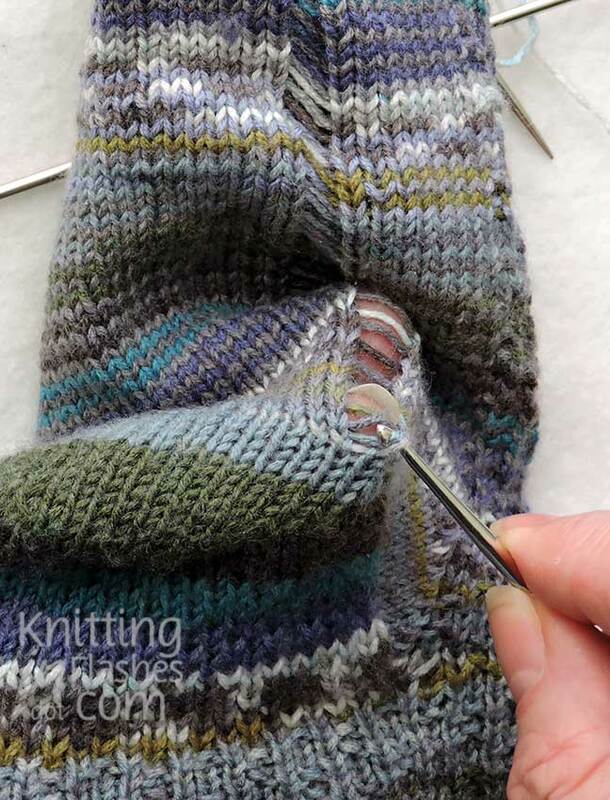 Removing the purl bump in the middle of the sole was a very easy task. 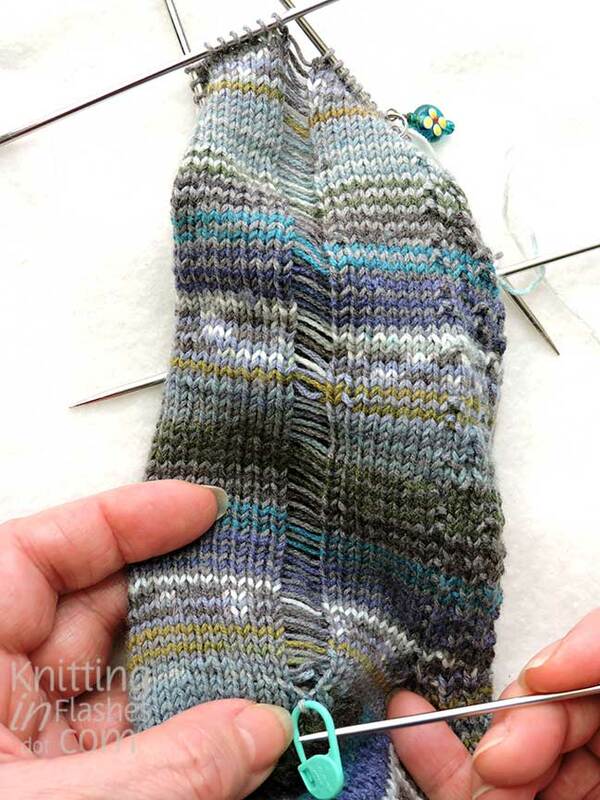 Untwisting the row of stitches on the heel was not. I used the same technique for both repairs but I had to rip out the toe shaping to get down to the twisted stitches. Not really a big deal as it was only 21 rows of decreasing numbers for a total of 892 stitches…but who’s counting, right? Much better than ripping out the entire foot! Remember when you got a run in your stockings or tights and it was the end of them? If you were lucky, you could stop the run from getting bigger by dabbing a bit of nail polish on the end. Well, I created a run on purpose. 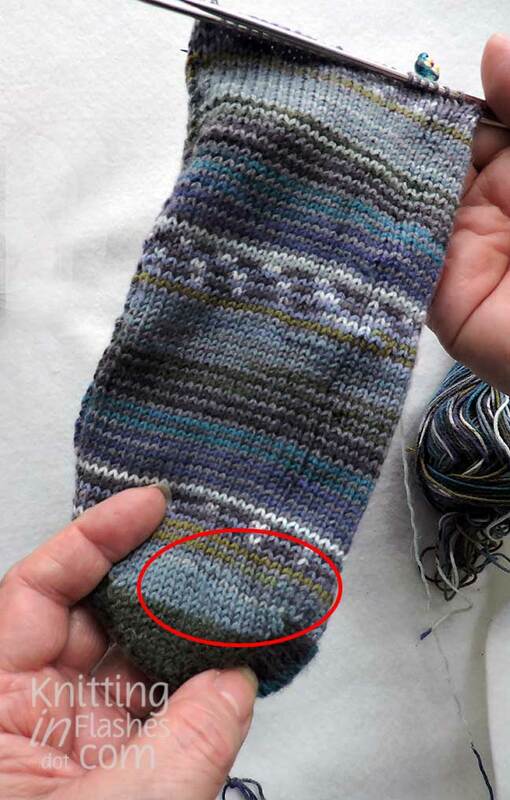 Knitters will understand this but for the rest, I’ll explain why I did this and how to fix it. 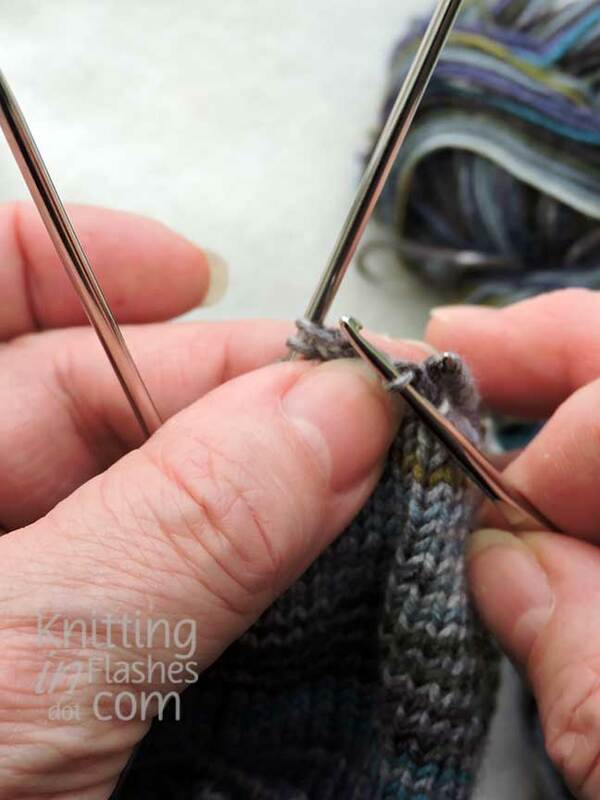 Secure the offending stitch, be it a dropped stitch, twisted stitch or the wrong stitch (knit instead of purl or vice versa). Release the top stitch in the column directly above the offender. In my case, it was 70 or so rows above. 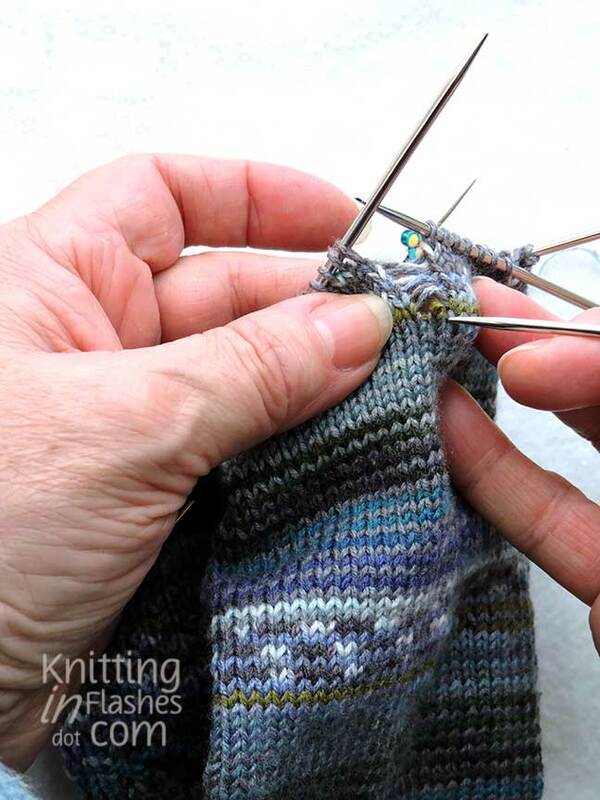 *Note to self – periodically check knitting for dropped, twisted or the wrong stitch. Don’t wait until the end to look! Run, stitch, run! Help the run along all the way down to the secured stitch. I was amazed at how much yarn one little stitch used. 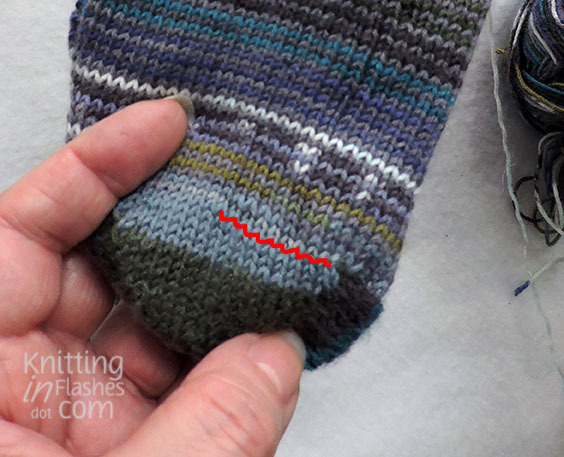 Twist that stitch and it will make a tight ridge on the wrong side. 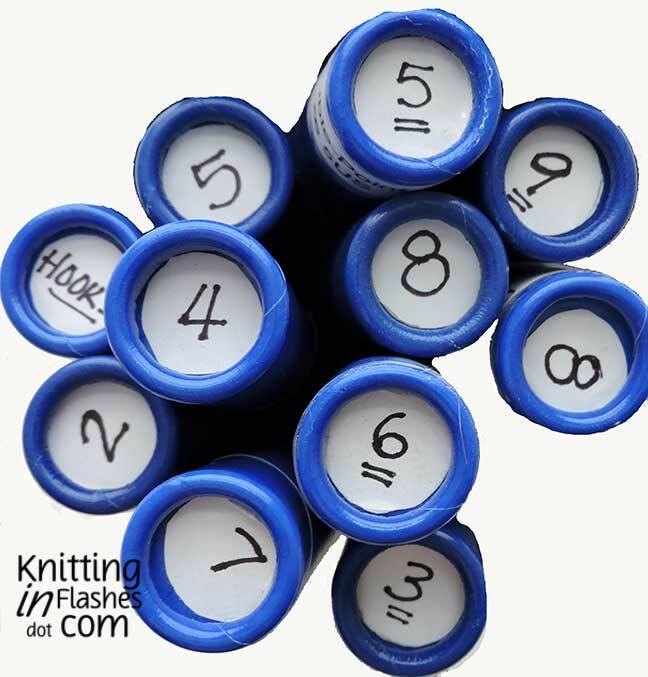 …and following the stitch pattern, pick up the stitch and reknit it and all the other stitches in that column up to the top. 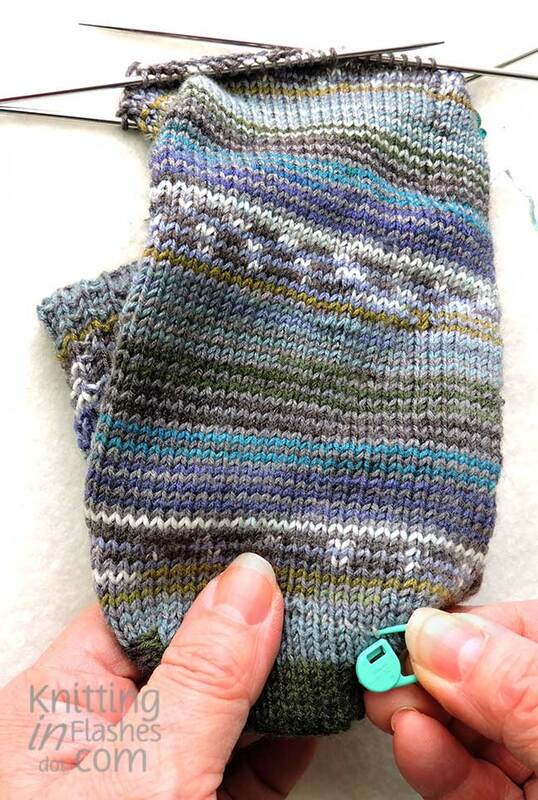 Fortunately, the stockinette stitch is the easiest to pick up and reknit. See my fingers poking through the run!? 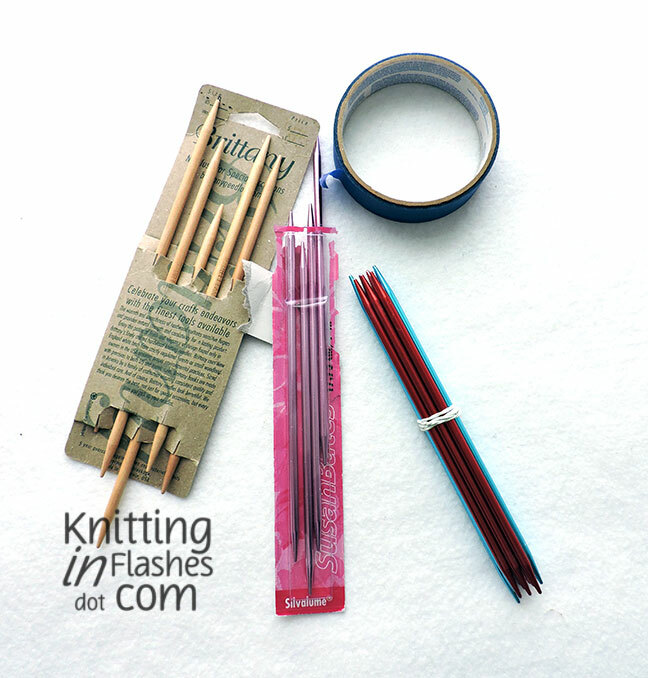 Secure the stitch onto the tip of the knitting needle. Repeat until all stitches are secured, accounted for and where they belong. No more twisted stitches. They might be a bit tight but once I give them a good soak, they should will (hopefully) relax a bit though I’ve not tried it with this yarn. And the purl bump is gone because I fixed it before I took these pictures. Even though I had several twisted stitches to do, I only did one column at a time. Seeing how much yarn one stitch uses, it can be easy to pick up the wrong section of yarn or in the wrong row order if there is more than one stitch worth of yarn. The problem(s) that creates is not worth the perceived time saved. Trust me. Experience is a great teacher. 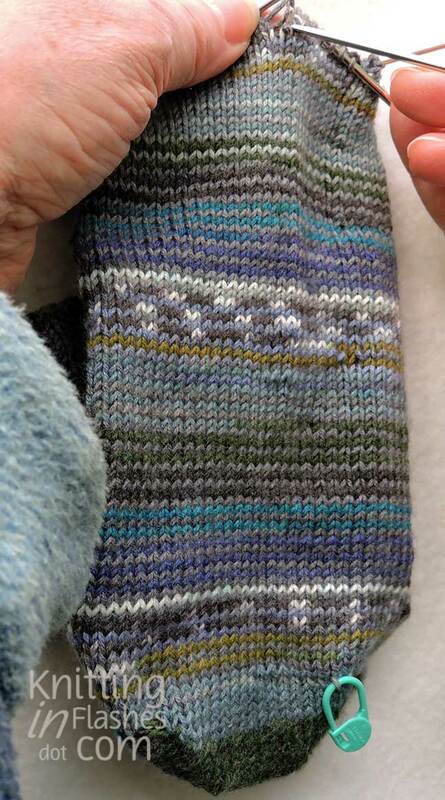 Now all I have to do is reknit the toe and knit the second sock. 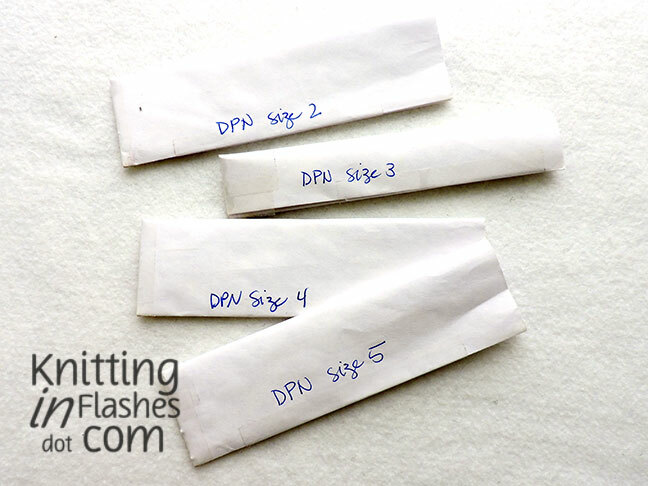 I was cleaning up my knitting bag and had to come up with another plan for all my double-pointed needles (aka dpns). I’m not a Magic Loop convert yet so most of my socks and other knitted-in-the-round items are made using dpns. I know I bought some of these but I also inherited some. 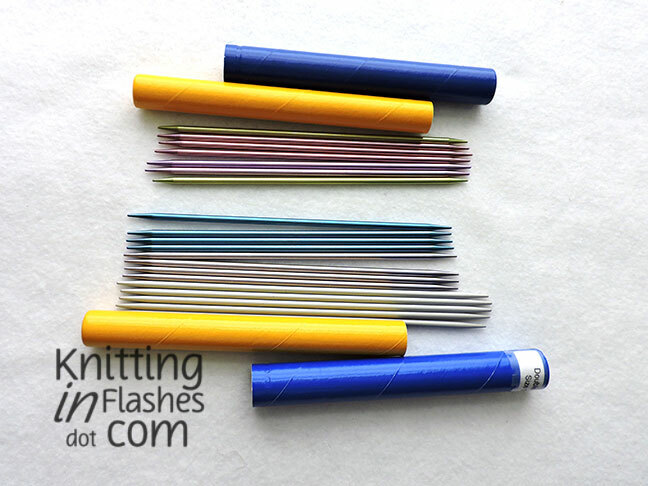 In the beginning, the needles were safe and organized in the original cardboard packaging. Then the packaging fell apart. 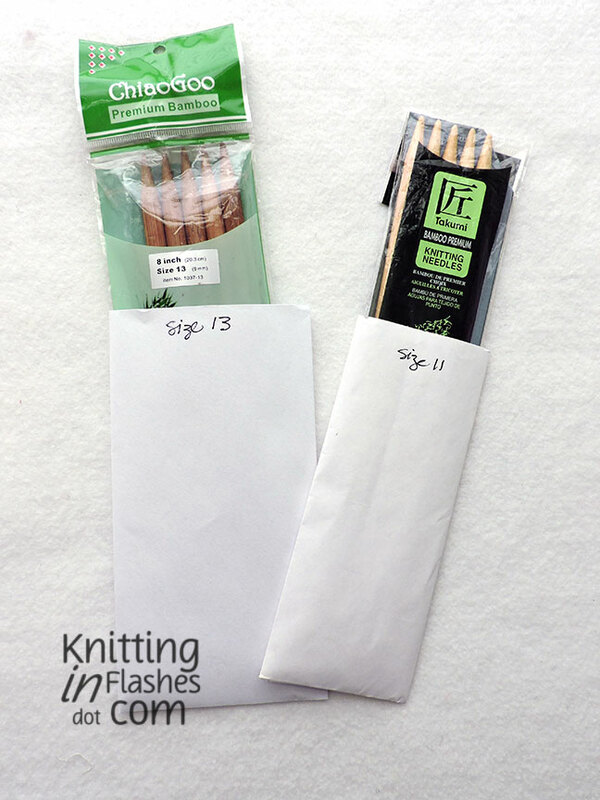 The inherited needles were held together with rubber bands or tape (Gasp!). 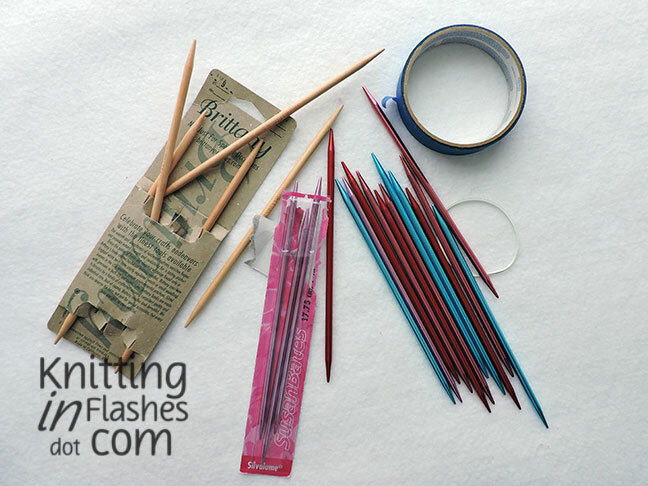 Rubber bands deteriorate rather quickly and leave gunk on the needles. And tape residue is sticky and rough. I made some holders from small paper envelopes and wrote the sizes on the front. That worked for awhile but it wasn’t a fantastic solution. 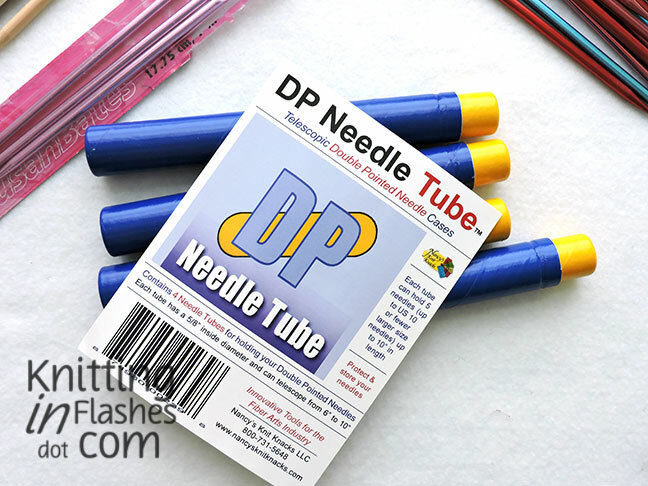 Enter these double point needle tubes*! Now my needles have a more secure home. I cut out some circles (address labels), wrote the size and stuck them on the end so I can see at a glance what needle I have/need. 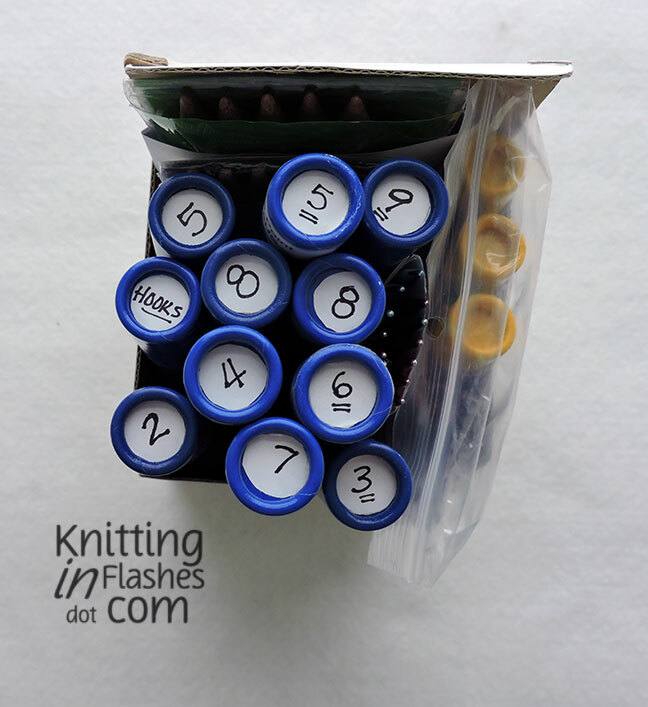 The tubes are adjustable so they can accommodate shorter or longer needles. I even keep some crochet hooks in one as every knitter sometimes needs one of those. They now live in the knitting bag of tools and supplies. Sets of size 10 1/2 and above are too large to fit inside these tubes so until the Super Duper Sized tubes arrive, I will keep them in my make-shift holder. I’m not sure how I ended up with so many size 8 dpns. But can one really have too many? *I received no compensation for this review. I just like this product and thought you might, too.